Characteristics: Adults have antennae with an abrupt, 3-segmented club. Sides of the thorax are rounded and although wings are functional, this insect commonly flies only short distances. Except for antennal and thorax differences, red flour beetles are almost identical to the confused flour beetle. What Do Red Flour Beetles Look Like? Red flour beetles are shiny and reddish-brown in color, they have a flattened, oval shaped body and are winged. They will use their wings to fly short distances. Adults will grow to be about 1/8th of an inch in length. Red flour beetles have distinctive antennae that abruptly end into an enlarged three-segmented club. Is The Red Flour Beetle And The Confused Flour Beetle The Same Pest? The red flour beetle and the confused flour beetle are both flour beetles but are considered to be different species. Both are pests that infest flour and cereal products and invade and become problematic in homes, grocery stores, mills and food processing plants. But the red flour beetle originally originated from Asia, while the confused flour beetle originated from Africa. 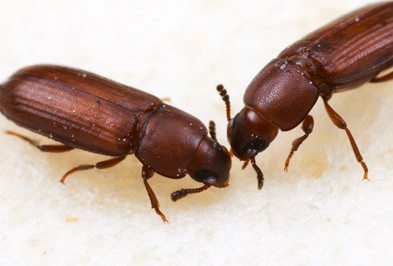 Even though they are different species they are so similar that that confused flour beetle was named so because it is so commonly “confused” with the red flour beetle. In fact they are so similar appearing that it is almost impossible to tell the two apart except under a magnifying glass. The confused flour beetle has a four-segmented antenna that gradually enlarges towards the tip into a “club”, while the red flour beetle has its’ abrupt ending three-segmented antenna. Visit http://entnemdept.ufl.edu/creatures/urban/beetles/red_flour_beetle.htm for more information. Why Do I Have A Red Flour Beetle Problem? The red flour beetle is of Indo-Australian origin and now occurs worldwide in the warmer climates. In the United States, it is found primarily in the southern states in homes and grocery stores. What Are The Signs Of A Red Flour Beetle Infestation? The most common signs that red flour beetles have invaded your home is to see the actual beetles either crawling or flying throughout your home, or by seeing them in your flour or cereal products. You may also notice holes where they have chewed through the packaging of flour or other dry cereal products that are stored in your kitchen or pantry areas. What Kind Of Threat Do Red Flour Beetles Pose? Appropriately named, the red flour beetle has a habit of infesting flour and will feed on whole kernels or undamaged grain. Although humans are not harmed by this pest, red flour beetles do impart a disagreeable odor and taste to the flour they infest. How Do I Control Red Flour Beetles? Because these pest are found in our food supply, treating them with pesticides, if not properly trained can be harmful to people and pets. Contacting Holder’s Pest Solutions at the first sign of a red flour beetle infestation is the most effective way to protect your food items from this pest. Good sanitation efforts, inspecting items and keeping your home or business ventilated can also help keep these pests from entering your property.